Fire Lined Medical Gas Cylinder Storage Cabinets with Safe-T-Door are designed for 4 D- and E-size cylinders up to 33-3/4 in. long x 4-1/4 in. diameter. Protect medical gas cylinders from damage, theft and tampering while separating them from flammable and combustible materials. 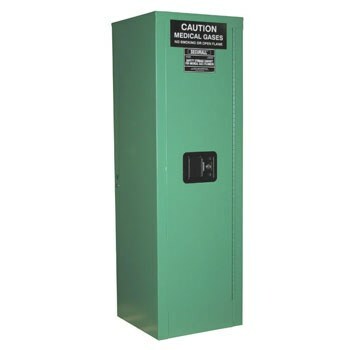 Medical Gas Cylinder Cabinets comply with current OSHA regulations and meet storage requirements set forth in NFPA codes 99, 101 and 30.